Learn how to monitor web service concurrency performance by specifying a concurrency limit (quota). A Concurrency Quota Policy is a Quality of Service (QoS) policy that allows you to monitor the web service concurrency performance by specifying a concurrency limit (quota) that represents the maximum number of connections, and configuring fault and alert notifications. You can also define Alert Codes in the Alerts > Alert Codes section and enable and select them in the policy definition. 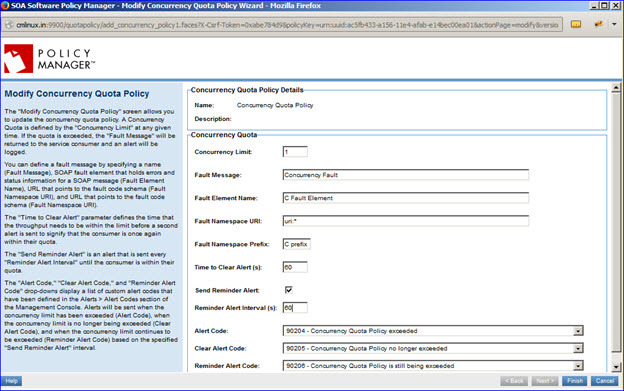 If the specified concurrency limit is exceeded, Policy Manager returns a fault and sends an alert. Go to Workbench > Browse > Organization, and select Policies > QoS Policies. 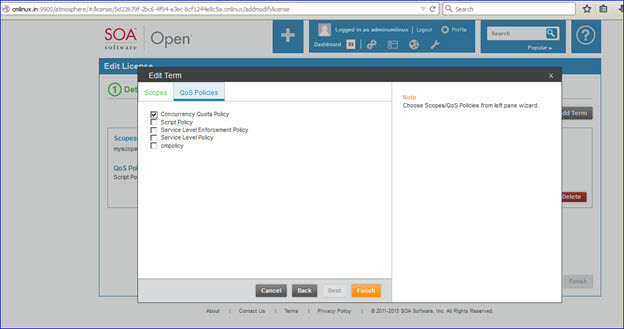 The Policies Summary is displayed. Concurrency Limit: Allows you to specify a concurrency limit (quota) that represents the maximum number of concurrency connections. If the limit is exceeded, a fault message is returned to the consumer and an alert is logged. Fault Message: The name of the SOAP fault message to be returned if the quota is exceeded (<faultString>). Fault Element Name: The name of the SOAP fault element that holds errors and status information for a SOAP message. 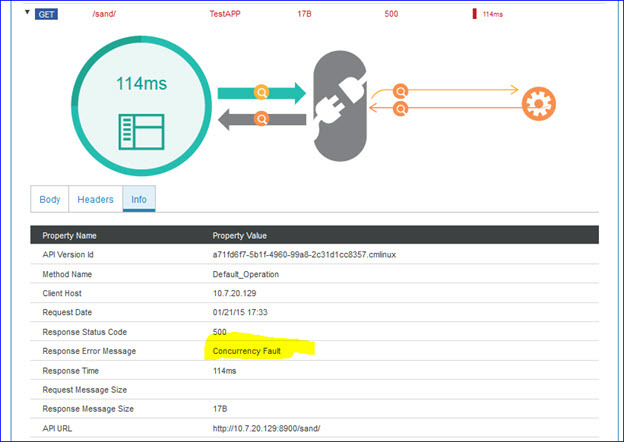 Fault Namespace URI: The URL that points to the fault code schema. Fault Namespace Prefix: Allows you to enter the fault namespace prefix. Time to Clear Alert(s): Allows you to enter the length of time for which the throughput needs to be within the limit before a second alert is sent to signify that the consumer is once again within the quota. Set Reminder Alert: Enables the Reminder Alert function. This function sends the alert that is selected on the Alert Code drop-down list. The alert is sent at the Reminder Alert Interval until the consumer is within the quota. Reminder Alert Interval(s): Allows you to enter an interval (in seconds) at which Reminder Alerts will be sent until the consumer is within the quota. Alert Code: A drop-down menu that displays a list of custom alert codes that you have defined. If you have "Send Reminder Alert" selected, alerts will be sent based on the alert interval defined using the selected Alert Code. For more information on defining an Alert Code, see About Alert Codes in the Policy Manager Online Help. Clear Alert Code: A drop-down menu that displays a list of custom alert codes that you have defined. If you have "Send Reminder Alert" selected, alerts are sent when the alert condition no longer exists. Reminder Alert Code: A drop-down menu that displays a list of custom alert codes that you have defined. If you have "Send Reminder Alert" selected, alerts are sent based on the specified interval when the condition continues to be exceeded. Let's take a quick walkthrough of the Concurrency Quota Policy configuration process to get you started. 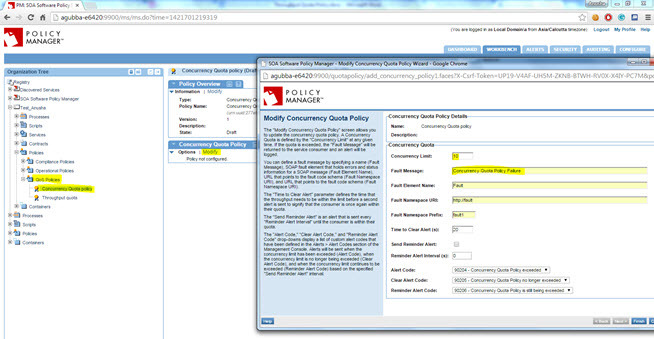 In Policy Manager, to create a Concurrency Quota Policy instance, go to Policies > QoS Policies and choose Add Policy. After you've attached the Concurrency Quota Policy to a web service, operation, or binding, send a request to your service and go to the Services > Monitoring section to view the results for Logs, Real Time Charts, and Historical Charts. For more information on using the monitoring functions, refer to the Policy Manager Online Help, available via the Help button. This section provides a list of Policy Manager-specific usage scenarios for the Concurrency Quota Policy. Generate an alert and send an email to the administrators if a service receives more than 10 concurrent requests. Provide service details and click Finish. Navigate to Organization > Policies > QOS Policies and use Add Policy to create a Concurrency Quota Policy. Configure the Concurrency Quota Policy with 10 Concurrency Limit and a custom Fault message. 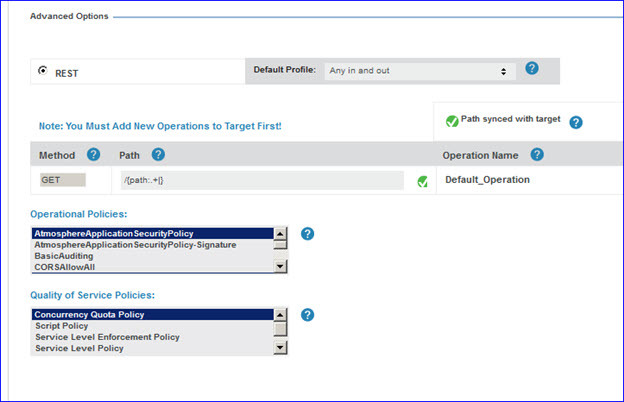 Activate the policy, and attach it to the Vs1 service in the Service Details > Policy Attachments > QoS section. Send 20 concurrent requests from the application/client to the Vs1 service. When the concurrency limit has been exceeded, the Fault Message will be returned to the service consumer and an alert will be logged at the service level. 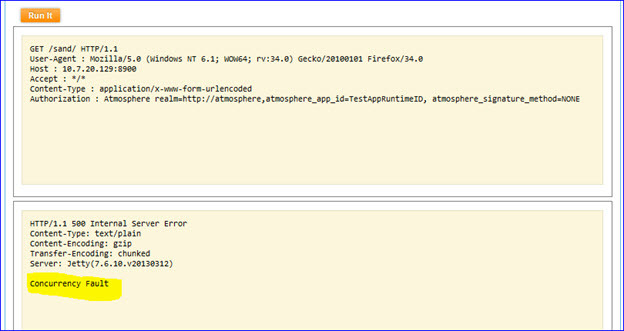 The details in the usage logs show the error being displayed as configured in the policy. In the alert code, an email must be configured that will be sent to the administrator(s) as shown below. Generate a remainder alert and run a Management Script if more than 10 concurrent requests per 10 seconds are received repeatedly by a service in the 100 seconds. 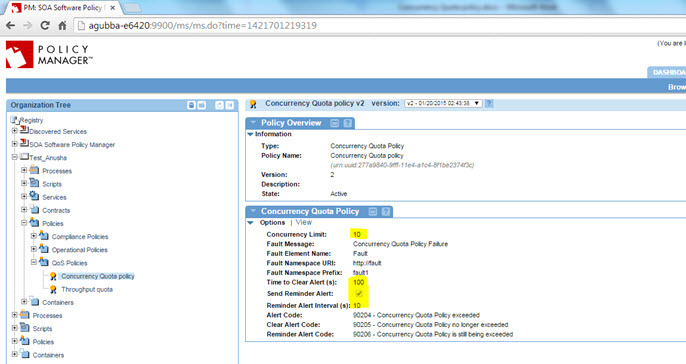 Configure the Concurrency Quota Policy with 10 Concurrency Limit and a custom Fault message. Set Remainder Alert interval to 10 seconds and Clear alert time interval to 100 seconds. During the first 10 seconds no alert is shown. 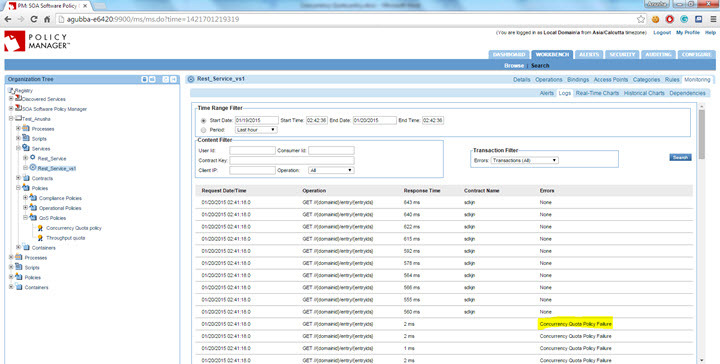 If the concurrency hits are seen after 10 seconds, a remainder alert is thrown which is valid for the next 10 seconds. After the first interval of 10 seconds, if the concurrency hits are still observed, there is another remainder alert. In the Alert code, a script can be configured to run (for example, to store any sort of information related to the alert). Configure the Concurrency Quota Policy with 15 Concurrency Limit and a custom Fault message. Activate the policy, and attach the Concurrency Quota Policy to a contract which serves Vs1 and Vs2 services. When the concurrency limit has been exceeded, the Fault Message will be returned to the service consumer and an alert will be logged at contract level. In the next 100 seconds, if the policy is not violated, a clear alert is sent. This section provides a list of Community Manager-specific usage scenarios for the Concurrency Quota Policy. Scenario 1: How Do I Verify Concurrency Quota Policy at the Service Level? Scenario 2: How Do I Verify Concurrency Quota Policy at the Contract Level? Scenario 3: How Do I Verify Concurrency Quota Policy at License > Term Level? If you are using a Concurrency Quota Policy with Community Manager, you must first add the policy to the Community Manager Tenant Organization in Policy Manager. Once that's done, it will be available for selection in the developer portal. 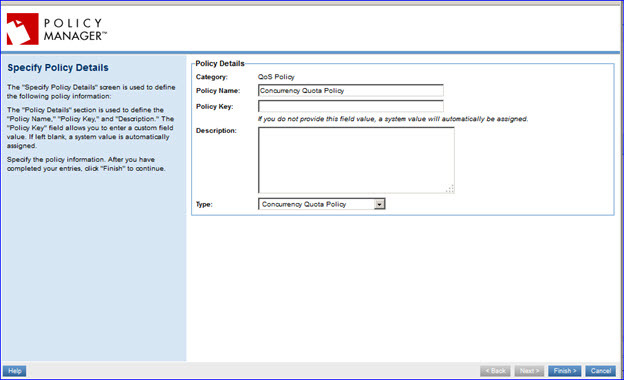 Go to the Policy Manager Management Console > Tenant Organization > Policies > QoS Policies and click Add Policy. 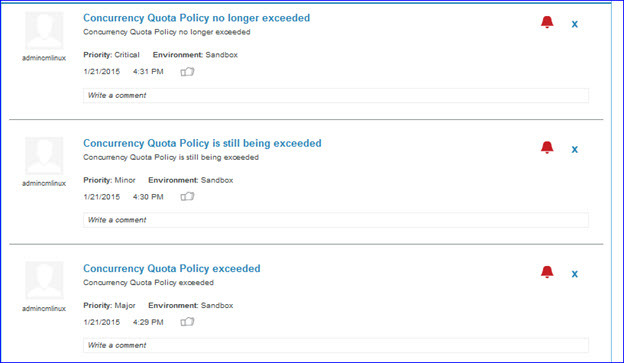 Specify Policy Name, Policy Type (Concurrency Quota Policy), click Finish, and then click Close. 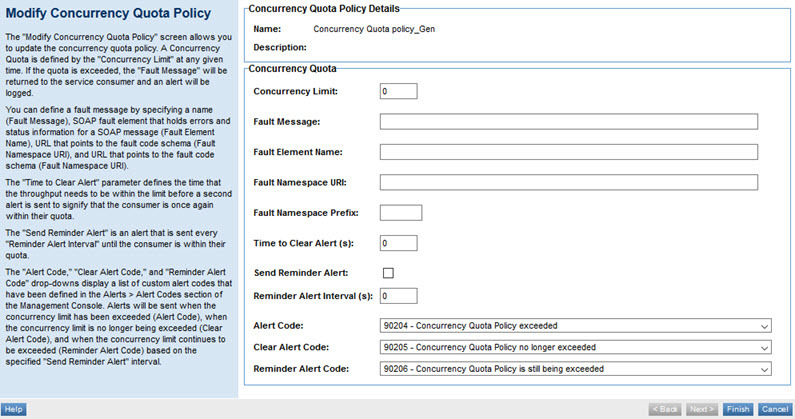 On the Concurrency Quota Policy Details screen, click Modify. Provide the policy details and click Finish. Attach the Concurrency Quota Policy to the API implementation. Request API access. Verify that the contract is activated. Go to Test Client and send continuous requests. This policy condition will be met only when hitting concurrent requests (i.e., sending multiple requests in 1 second). This behavior is shown below using SoapUI and Test Client. Start one load test to send continuous requests from SoapUI. Also send requests from Test Client one by one. When multiple requests are received, the policy condition is met and you'll see a fault message in the response window. Alerts will be displayed in the Community Manager API> BOARD (as shown below). Attach the Concurrency Quota Policy at the Contract Level and activate the contract. Now Go to Test Client and send continuous requests. 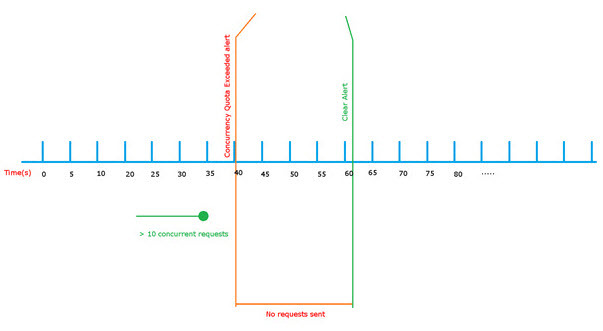 This policy condition will meet only when hitting concurrent requests (i.e., sending multiple requests in 1 second). This behavior is shown below using SoapUI and Test Client. Alerts will be displayed in the Board for the API. 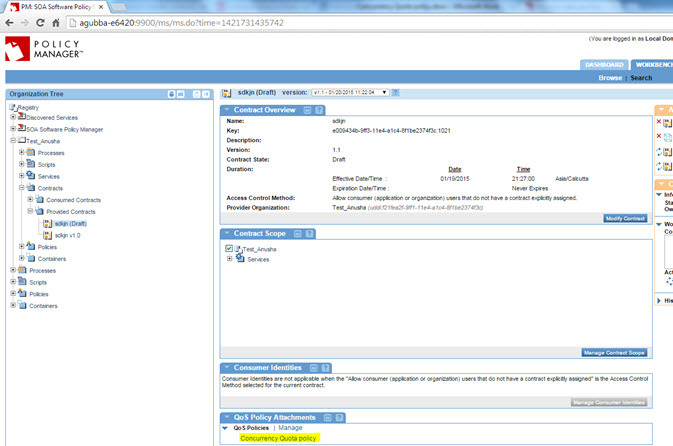 Alerts will also be displayed in the Policy Manager Registry. Edit License and attach Concurrency Quota Policy. Next, test the Concurrency Quota Policy at the License term level. This assumes that the same scope (as above) is used for Scope mapping, and the same license is selected while requesting API access. Go to Test Client and send continuous requests. This policy condition will be met only when hitting concurrent requests (i.e., sending multiple requests in 1 second). Alerts will be displayed in Community Manager, in the Board for the API. In the API Monitoring Logs, the following logs will display for concurrency faults.